Detailed map of the municipality of Den Helder, showing: De Helder, Nieuwediep, Nieuwstad, Huisduinen, de Kooi, het Buitenveld, het Koegras, de Vijf pachthoeven, de Polder, Kielstreek, Schulpengat, Helsdeur and Balgzand. 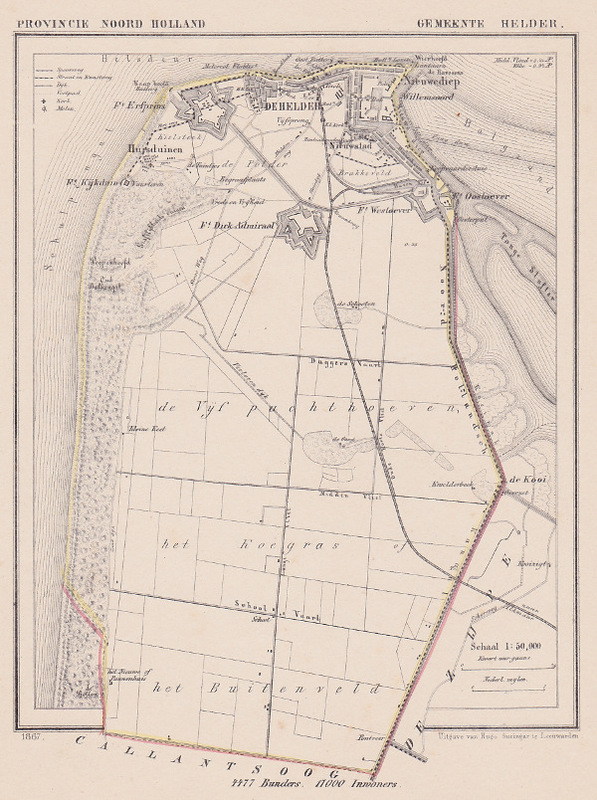 The community had at that time 17,000 people and had 4477 hectares. Looking for an antique map, historical print or plan? Feel welcome and browse our mapsite atlasandmap.com! We have maps, made by Kuyper (Kuijper) . more map communityplan of Noord-Holland like Gemeente Helder (Den Helder)more maps by kuyper like Gemeente Helder (Den Helder)Please contact us if you don't find where you are looking for! We ship worldwide.